This study describes an association between the temperate zone fish Oxylebius pictus and sea anemones in Barkley Sound, Vancouver Island, British Columbia, Canada. Fish were observed swimming and resting unharmed among the tentacles, or next to a column of Urticina lofotensis (98% of all observations) and U. piscivora (2% of all observations). These associations were most commonly observed at moderately exposed sites where there were relatively high densities of O. pictus and anemones. Most associations occurred at night when the fish were inactive. Small young-of-year fish (< 6 cm total length) associated closely with sea anemones, larger individuals spent less time with their hosts, and most adults (> 12 cm total length) sheltered in rock holes and crevices. Experiments demonstrated that small O. pictus were more vulnerable to predators than large individuals. Urticina lofotensis and U. piscivora were large, persistent structures in the study habitats that provided effective refuge for O. pictus from predators. Anemone size, shape, tentacular adhesive force, and presence of copepod associates influenced patterns of host specificity. Oxylebius pictus fed on copepods and other crustaceans that associated with U. lofotensis and host sea anemones served as both refuges and feeding habitats for the fish. 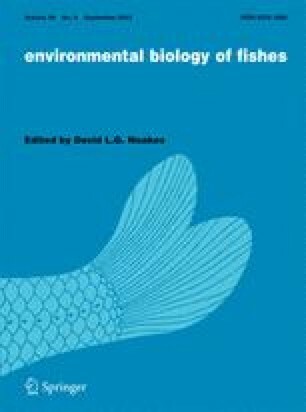 The sea anemones did not appear to receive any significant benefit from the relationship and the fish was considered to be a facultative commensal.